The reason this blog has been been quiet was down to December being a bit of a busy month. I work full time on a monthly magazine. My team and have four weeks to get an issue out. But due to the Christmas holidays, we began work on our last issue on 7 December and had to finish it on Christmas Eve. That meant late evenings and weekends stuck in the office. And after that a lack of internet access over the Christmas holiday itself meant blogging was a bit difficult. Despite that work continued on my short, Goodbye, as I storyboarded it. Given the short's format - three minutes long, and simple shots - storyboarding it isn't vital. But sketching out the shots helped definitely helped to develop my visualisation of the film. But, somewhat bizarrely, aurally. As I drew (well as you can see below, "scrawled" would be a better description) the shots, I began paying close attention to what sounds would be needed. 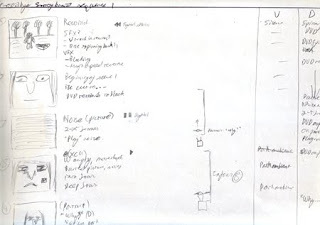 On the left are sketches of shots, with notes to the right. In the left are details of the audio needed for each shot. The diagrams in the middle are camera plans. As a viewer I focus my attention on dialogue, rather than a film's music or sound effects has caused me to pay little thought to sound in my scripts, handing control over to the director. This time I am the director, so ignoring sound effects would be dangerous. So alongside series of shots on my storyboards, I added notes about what background noises would be required. And what microphones would be needed. If I hadn't have begun sketching out the shots, I'm not sure when I would have thought about the audio side of this film. Perhaps when filming was just about to start and someone asked me where the microphones were. Storyboarding also made me realise there are two films I have to shoot: Goodbye and the home movie a character watches during it. Fortunately the home movie won't require much work. Relatively speaking.